DIY NailArts: 1. The power of Sparkle! Here comes the first nail art of the blog. I have described nail arts in words which are as simple for even a lay'man to understand. I know there are sites where the tools used are either costly or difficult to find. Don't worry, here comes the solution. The products used by me are easy to find. There is no need to have high class nail paints. A simple nail paint does all the work. Believe me or not, I have used nail paint which had cost me just rs.20 and they did wonders!! 3. Apply a layer of any colour of your choice. Here I have used Blue. 5. Choose any one finger nail on which you wish to apply sparkle. Mostly we go for ring finger as seen in my nail art. 6. Apply any kind of sparkle nail paint on that nail. See to it that it matches with your nail colour. Here I have used a silver sparkle colour nail paint. 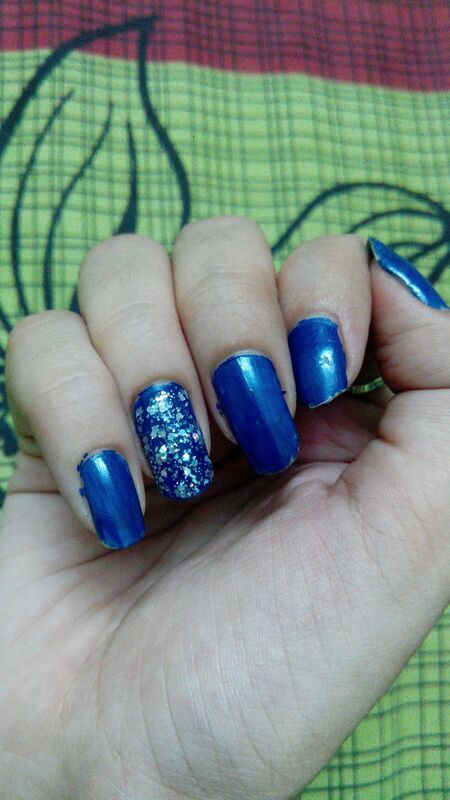 NOTE: If you are applying sparkle on your whole nail, never go for all the nails. While applying the sparkle paint, dab it instead of applying it like ordinary nail paints. It gives a better texture and spreads equally. If you liked this art, please stay tuned for my next art on next Saturday. Comment your reviews on. You may also follow my facebook page, Jyotsna Nail Arts. It's so simple and sweet..